We're glad to report that Philadelphia, the city with the largest percentage of bike commuters among large American cities, is joining its peer cities by installing its first green bike lane! 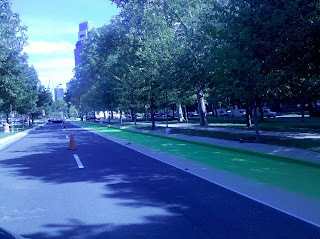 We spotted green paint going down on the Ben Franklin Parkway's new outer roadway bike lanes late this afternoon. These new lanes are part of the Parkway re-construction that the Department of Parks and Recreation formally announced in 2010. The construction project is improving the 2000-2200 blocks of the Parkway for pedestrians and cyclists, as reported back in July. The Bicycle Coalition worked with DPR and the Streets Department to improve the transition zone to help cyclists move across 20th Street safely over to the outer roadway, which will be made as part of this construction project. This is great news for Philadelphia and just in time for Bike Philly, whose route is on both sides of the Parkway. Have you registered yet? Slippery when wet. Bad idea! I saw this yesterday. I hope they do this for all bike lanes in the city. That's a total waste of money. The best model of a bike lane is a buffered lane (like in Spruce) and located on the left hand side of the or road (like in New York) because you are closer to the visual field of the driver who's also on the left hand side of the car. We're not getting separated infrastructure overnight. This is just a necessary step along the way. Colored lanes are common in nations with high cycling rates. I just wish we could start experimenting with the Dutch asphalt dyes. It doesn't affect the surface conditions and it doesn't wear off. Beroea, I live in Chicago where we have quite a bit of these green lanes and they really are not as slippery as you make it out to be. Only time I've ever had any problem is when I stop short, and even then really not something to complain about when compared with the awareness - to both drivers and the advocacy movement as a whole - it brings.